PEDMARK is an investigational drug and has not yet been approved by the U.S. Food and Drug Administration (FDA) or any regulatory authority. PEDMARK TM was studied by cooperative groups in two Phase 3 clinical studies of survival and reduction of ototoxicity, The Clinical Oncology Group Protocol ACCL0431 and SIOPEL 6. The cancers being studied in the two studies are very rare, although the burden of ototoxicity is disproportionate among affected children due to the efficacy of cisplatin in these diseases. SIOPEL 6 enrolled only standard risk hepatoblastoma patients. The COG ACCL0431 protocol enrolled one of five childhood cancers typically treated with intensive cisplatin therapy, including newly diagnosed hepatoblastoma, germ cell tumor, osteosarcoma, neuroblastoma, and medulloblastoma. Final results from SIOPEL6 were published in the The New England Journal of Medicine in June 2018. Final results from the completed COG ACCL0431 study in 126 children was published in Lancet Oncology in December 2016. The data from both PEDMARK clinical trials presented are described below. SIOPEL 6 study, “A Multicenter Open Label Randomized Phase III Trial of the Efficacy of Sodium Thiosulfate in Reducing Ototoxicity in Patients Receiving Cisplatin Chemotherapy for Standard Risk Hepatoblastoma,” is being conducted by The International Childhood Liver Tumour Strategy Group, SIOPEL. The study was initiated in October 2007 and completed enrollment of 109 evaluable patients in December 2014. Efficacy outcome based on audiometric results were evaluated on an ongoing basis as each child reaches the age of 3.5 years. The primary endpoint of the study was centrally reviewed absolute hearing threshold, at the age of ≥3.5 yrs, by pure tone audiometry, graded by Brock criteria. Newly diagnosed patients with standard risk hepatoblastoma are treated with 4 chemotherapy courses every 2 weeks before surgery and 2 courses after surgery. Patients are randomly assigned to receive cisplatin alone or cisplatin followed by STS. Cisplatin 80 mg/m² is administered i.v. over 6 hrs. STS is administered i.v. exactly 6 hrs after stop of cisplatin over 15 minutes at 20g/m². One hundred and nine randomised patients (52 Cis and 57 Cis+STS) are evaluable. The combination of Cis+STS was generally well tolerated. With a follow up of 52months, 3yr EFS is Cis 78.8% and Cis+STS 82.1% 3yr OS is Cis 92.3% and Cis+STS 98.2%. Treatment failure defined as PD at 4 cycles was equivalent in both arms. 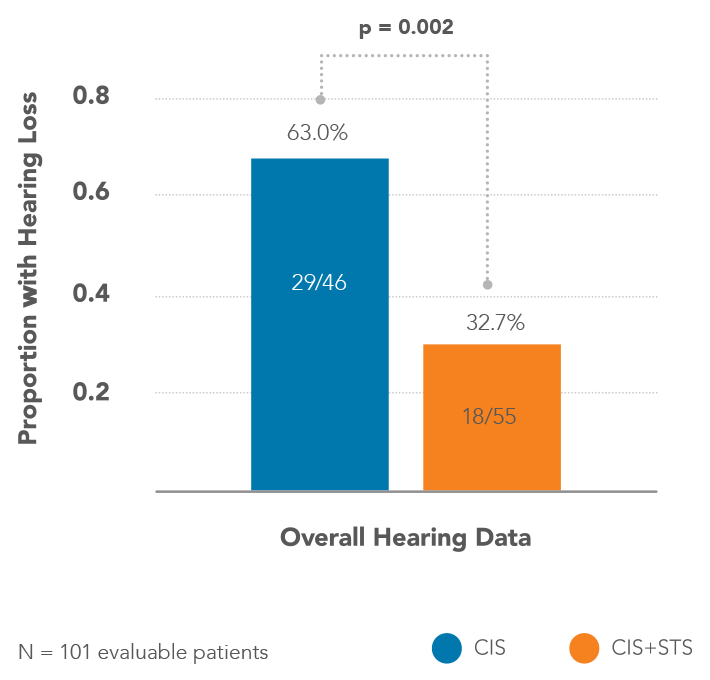 Among the 101 evaluable patients, hearing loss occurred in 29/46=63.0% under Cis and in 18/55=32.0% under Cis+STS, corresponding to a relative risk of 0.56(P=0.002). This randomized Phase 3 trial in SR-HB of cisplatin versus cisplatin plus sodium thiosulfate shows that the addition of sodium thiosulfate significantly reduces the incidence of cisplatin-induced hearing loss without any evidence of tumor protection. COG Study ACCL0431, “A Randomized Phase III Study of Sodium Thiosulfate for the Prevention of Cisplatin-Induced Ototoxicity in Children,” finished enrollment of 131 patients in Q1 2012. The patients had been previously diagnosed with childhood cancers. 125 eligible subjects were enrolled with germ cell tumor (32), osteosarcoma (29), neuroblastoma (26), medulloblastoma (26), hepatoblastoma (7) or other (5). Of these, 104 subjects (64 male and 29 <5 years old) were evaluable for the primary endpoint. Subjects were randomized either to no treatment (control) or treatment with STS 16 grams/m2 IV over 15 minutes 6 hours after each cisplatin dose. Hearing was measured using standard audiometry for age and data were reviewed centrally using American Speech-Language-Hearing Association criteria. The proportion of subjects with hearing loss assessed at 4 weeks post the final cisplatin dose (primary endpoint).. The proportion of hearing loss for STS vs. Control was 28.6% (14/49) vs. 56.4% (31/55), respectively (p=0.004). STS protects against cisplatin-induced hearing loss in children, especially for those < 5 years old.